Now, here is a mystery for you to solve. People world-wide have reported hearing a very peculiar “trumpet” sound emanating from the sky. The sound has not only caused alarm , but fear as well. it also makes people behave strange when listening to it. For the moment, all scientists can offer are speculations. No-one really knows what is causing the evil-like trumpet sound. Are extraterrestrials behind the sound? Is it a sign from God or a natural phenomenon? In the final book of the New Testament known as the Book of Revelation, angels are shown to be sounding trumpets, accompanied by a variety of supernatural plagues upon Planet Earth. And now, mysterious, unexplained sounds in the sky that some are likening to trumpet blasts are puzzling people all over the world. 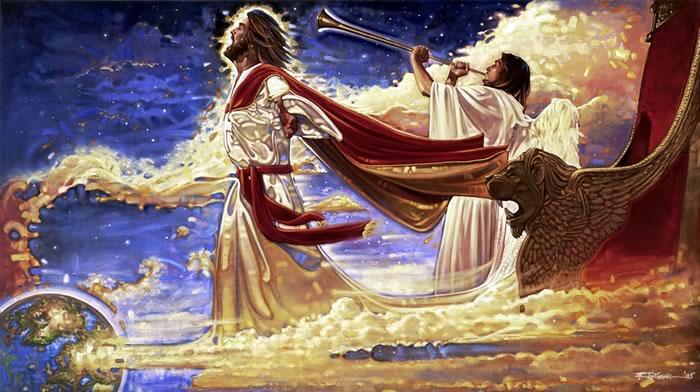 Throughout the Book of Revelation, the apostle John, who was writing Aegean Sea island of Patmos, described the voices of angels as sounding like trumpets. The eighth chapter of Revelation notes seven angels having seven trumpets to sound, and when they do, catastrophic events unfold, including a scorching of a third of all green-plant life on Earth, a third of the sea becoming blood and swarms of locusts given the power of scorpions. The apostle Paul described the resurrection of dead believers in Jesus to occur at the “last” trumpet blast. Footage has flooded YouTube from locations as varied as British Columbia in Canada, Allen in Texas and Queensland in Australia. The sound resembles something from Hollywood movies, like The War of the Worlds or Close Encounters of the Third Kind. It starts without warning and has people transfixed in the street as it continues. Now, even experts admit they cannot tell whether the sound is created by extraterrestrials, our own Earth or something else totally unknown. Earlier this month a couple shot a clip in Germany where a child can be seen standing stock-still as it occurs. Kimberly Wookey from British Columbia in Canada wrote on YouTube: “This is the second time I personally have heard these sounds here in Terrace, BC, Canada. “On the morning of August 29th 2013 at approx. 7:30am I was awoken by these sounds. “I shot out of bed and ran looking for a camera to try to capture them with. Came out into the living room to find my seven-year-old son awake and scared wondering what was going on. I’ve had vivid nightmares ever since I posted the very eerie strange sounds that has Missoula talking and looking towards the sky; awful, awful nightmares. My wife woke me from a dream last night where she says I was screaming like she’s never heard me scream before. I was taking my daughter out for her daily exercise along with my dog. I started to hear the sounds early on in our little adventure and the first time it was heard my dog perked her ears up and my daughter stopped in her tracks. That sound was identical to the one I had taped later, and lasted just as long. Now since I’ve been following this worldwide strange sounds phenomenon for some time, the whole “End of the world” thing popped instantly into my head. What if this was one of those sounds? I had my phone ready to capture the next one just in case. Sure enough, five minutes later the sound had returned. Dr.Prof. Elchin Khalilov, a geophysicist specializing in the area of geodynamics and geotectonics has analyzed these odd sounds and says that most of their spectrum lies within the infrasound range, which means there is a lot we cannot hear. They are low-frequency acoustic emissions in the range between 20 and 100 Hz modulated by ultra-low infrasonic waves from 0.1 to 15 Hz. In geophysics, they are called acoustic-gravity waves; they are formed in the upper atmosphere, at the atmosphere-ionosphere boundary in particular. The problem is that people have heard this noise from the sky in regions where there were no geological activity and the sound in terms of both the area covered and its power far exceeds those that can be generated by the above-mentioned phenomena. According to Dr. Khalilov “the source of such powerful and immense manifestation of acoustic-gravity waves must be very large-scale energy processes. These processes include powerful solar flares and huge energy flows generated by them, rushing towards Earth’s surface and destabilizing the magnetosphere, ionosphere and upper atmosphere. Recently we experienced the strongest solar radiation storm since 2005 and it is estimated that Solar Cycle 24 will peak in 2013. Sun cycles are natural and happen every 11 years or so. Geophysicist believe that these sounds coming from the sky could possibly be somehow related to increased solar activity. Does the sound originate from within the Earth’s core? Dr. Khalilov mentions also the sounds could come from our own planet’s core. According to Dr. Khalikov ” there is one more possible cause of these sounds and it may lie at the Earth’s core. Back in November 2011, all Atropatena stations, a global network for the forecasting of earthquakes and record three-dimensional variations of the Earth’s gravitational field, almost simultaneously registered a powerful gravitational impulse. According to GeoChange Journal, “such a phenomenon is only possible if the source of this emanation is at the Earth’s core level. A third explanation that has not been mentioned by Dr. Khalilov is that these unusual sounds from the sky are caused by an astronomical anomaly which scientists have not yet been able to identify. If Dr. Khalilov is correct in his assumptions, the causes of acoustic-gravity waves are of a understandable geophysical nature. However, this would also mean our planet can expect a significant increase in solar activity and the geodynamic activity, which in turn results in strong earthquakes, volcanic eruptions, tsunamis and extreme weather events. I wonder if people in the past heard such sounds, or if it is a recent phenomenum. Any history buffs among your readers? Why Does Earth Only Have One Moon?